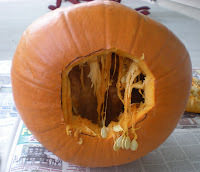 A few years ago I found a great way to carve our jack-o-lanterns; I think it was from Family Fun Magazine. I'm sure some of you may know this way, but I thought I would share it. 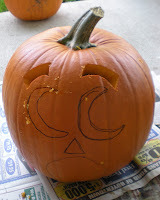 How in the world can one carve a pumpkin differently? The answer is in the way that you take out the insides. 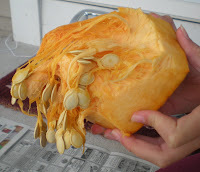 Instead of cutting the pumpkin open from the stem area, we cut a circle in the bottom of the pumpkin to pull everything out. 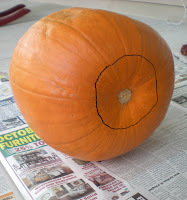 There is a lot of pumpkin "insides" attached to this spot and they pull out easily. 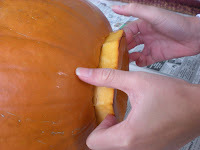 Emptying the pumpkin this way also makes it super easy to light the candle inside--if you're still old-fashioned like me and use a real candle. Plus, the lid doesn't shrivel up and start to fall inside on top of the candle after a few days. Everything else about the carving is the same, it's just the little twist of emptying it from the bottom instead of the top. So, we cut a circle in the bottom, and empty out the insides. We draw a face with a marker and cut out the shapes. 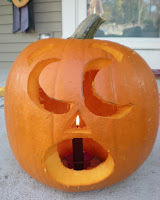 Then finally place the jack-o-lantern over the candle and he's ready to spook up the night! That is a great tip! I'm going to try that out later this week. juhuuuu! i have wait for this! thanks! 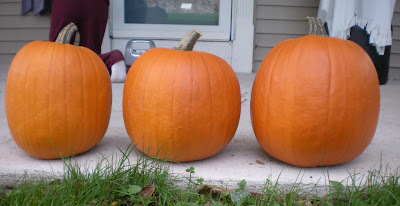 Nice pumpkins. 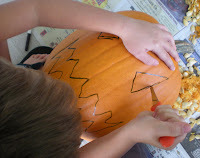 The kids are excited to carve theirs today. Yikes. They had some real big ones for sale and of course I had to buy them. It should be interesting. Thank you for sharing, I love your posts.